Create your first Windows Phone 8 Application. 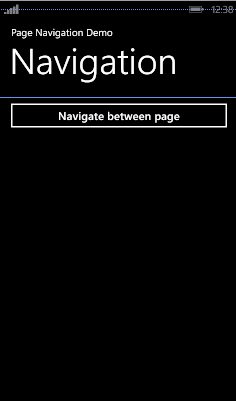 Page navigation is used to navigate from one page to another in Windows Phone 8. Navigation is managed by NavigationService Class. NavigationService provides Navigate method which navigates to the content specified by uniform resource identifier i.e. URI. Navigate method takes Uri, which is the name of the page on which you want to navigate. 1. Navigation from one page to another. 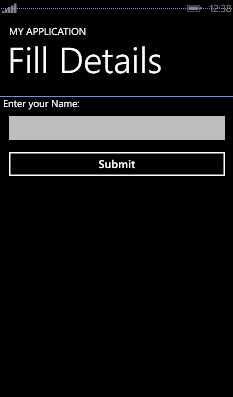 Create a New Windows Phone Application and select Windows Phone 8.0 as a target Windows Phone OS for this application and click on OK. Drop a button control on MainPage.xaml as shown in below image and named it as btn_navigationPage. Now, Right Click on Project -> Add -> Click on New Item. Add a Page (named it as AboutPage.xaml). 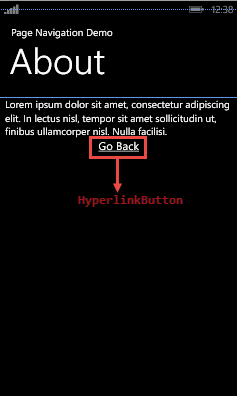 Add a HyperlinkButton control(named it as hlb_GoBack). Design the UI of page as shown in below image. In preceding code, we have called Navigate method which navigates to the content specified by uniform resource identifier. We set UriKind.Relative because AboutPage.xaml is part of the same project or XAP file. We have already added HyperlinkButton on AboutPage.xaml. 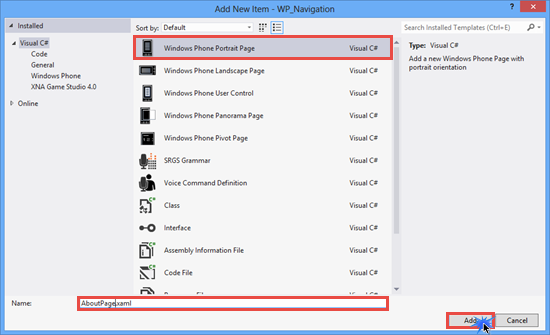 We will use this for navigating back to the previous page (We don't have to code for hardware back key button in Windows phone for navigating back to previous page). Double click on it to generate its click event and add the following lines of code. NavigationService.GoBack() method redirects the user to the previous page. Let's create a New Project and add a Page(named it as FillDetails.xaml). Drop TextBox (named as txt_Name) and Button(named as btn_Submit) control on it. 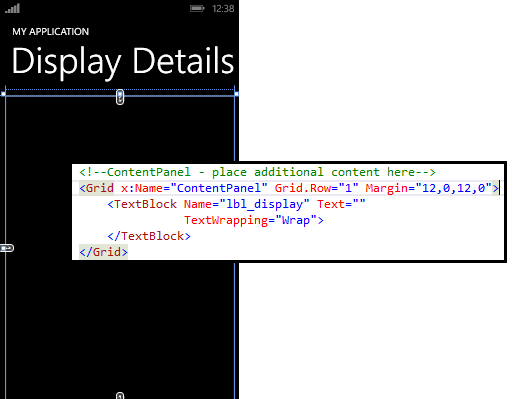 Add another page(named as DisplayDetails.xaml) on which we will display the data passed from FillDetails.xaml page. Now, go to FillDetails.xaml page and create click event of btn_Submit by double clicking on it. In preceding code, we passed name as query string parameter in Uri. 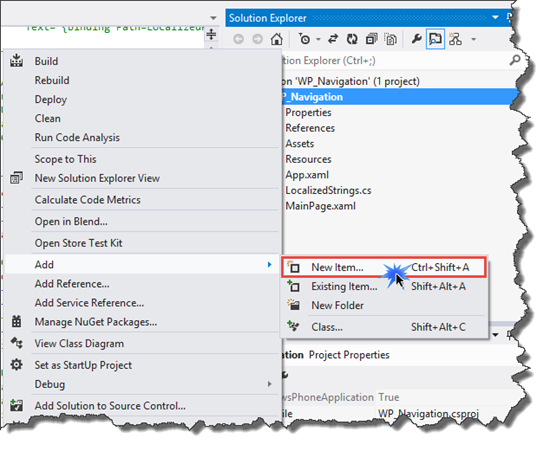 Open DisplayDetails.xaml.cs code and override OnNavigatedTo method. OnNavigatedTo method is called when page becomes the active page in a frame. Get the value from the query string and display it on lbl_display using the Text property.